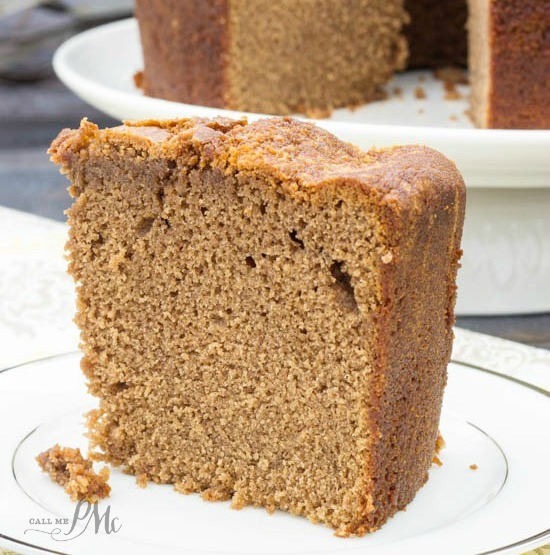 Chocolate Pound Cake recipe is dense, moist and lightly chocolate flavored. 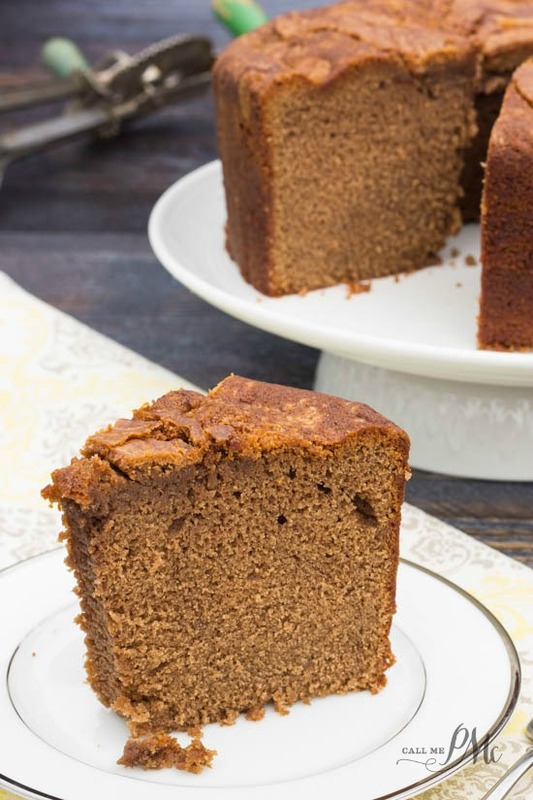 This classic cake recipe has a tender texture and small crumb and perfect for chocolate lovers! 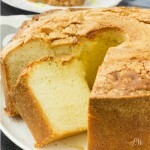 Until now, I’ve made somewhat traditional Pound Cake recipes in my series for testing Pound Cakes. 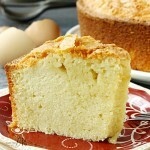 I shared Whipping Cream Pound Cake, Cream Cheese Pound Cake and Sour Cream Pound Cake. Today I’m sharing a unique, but equally as good. 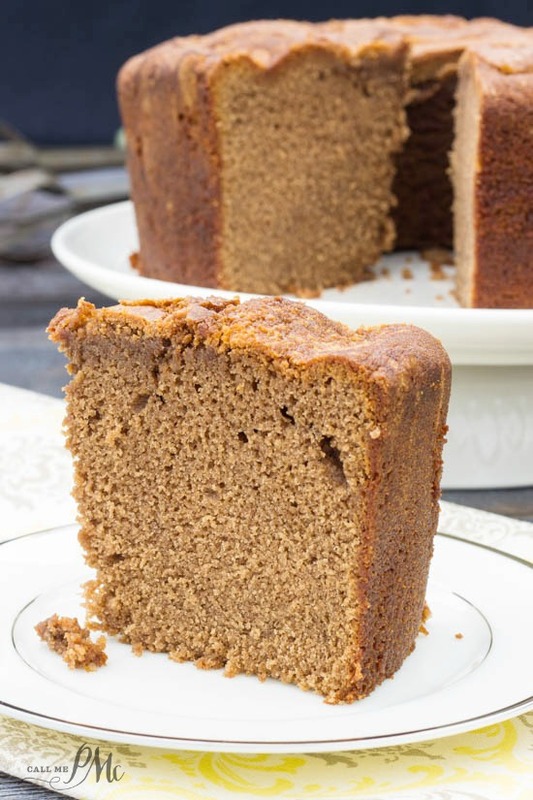 I have a Chocolate Pound Cake recipe for you today. 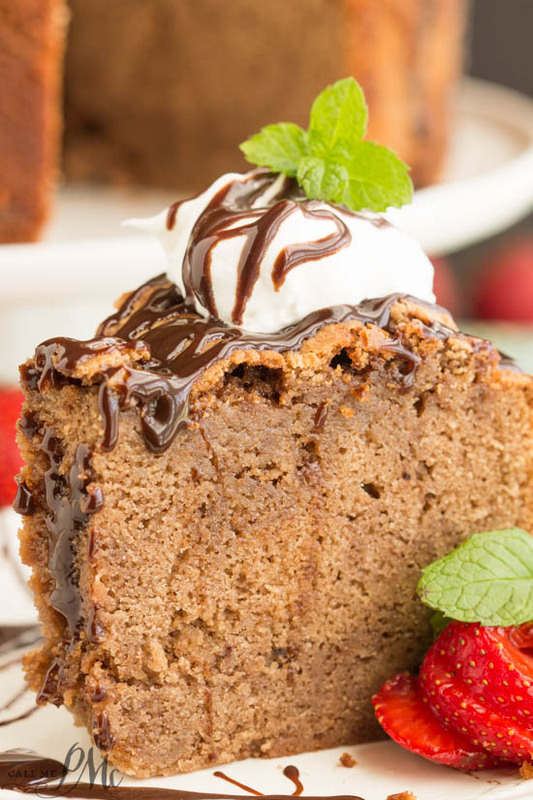 This Chocolate Pound Cake is buttery, dense, moist and lightly chocolate flavored. It’s not a dark, fudge chocolate confection like a brownie. Think more like ‘milk’ chocolate with a tender, small crumb texture. It’s flavored with cocoa powder, not melted chocolate. The cocoa gives it a subtle chocolate flavor perfect for non-chocolate lovers (gasp!) and chocolate lovers alike! Surprisingly, cocoa tends to dry cakes out so you have to compensate with extra liquid and/or fat. 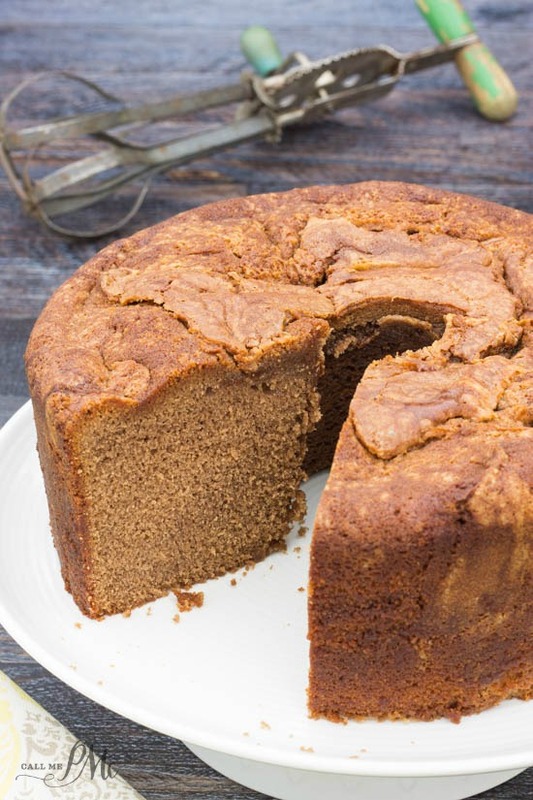 The addition of butter and shortening and a close eye when baking will keep this cake moist. I also added a small amount of strong coffee to the cake recipe. Coffee makes chocolate deeper more complex tasting and you cannot detect coffee in the recipe. If, however, you are really coffee adverse, add one cup milk instead of the 3/4 cup milk and 1/4 cup coffee to the recipe. I made this cake 3 times for you! Seriously, I was about to give up on sharing it. The first time I made it for the blog (I’ve made it dozen of times in the past.) I put it in the oven, set the timer and started cleaning house. After 45 minutes I checked on it and it sat there just like I had put it in. I didn’t realize that my oven element burned out after I had cooked biscuits that morning. The oven would only get to 200 degrees. Then I made it and it stuck to the pan because I picked up a cheap non-stick spray! Lesson learned. Alas, the third time was a charm and I present to you Chocolate Pound Cake! 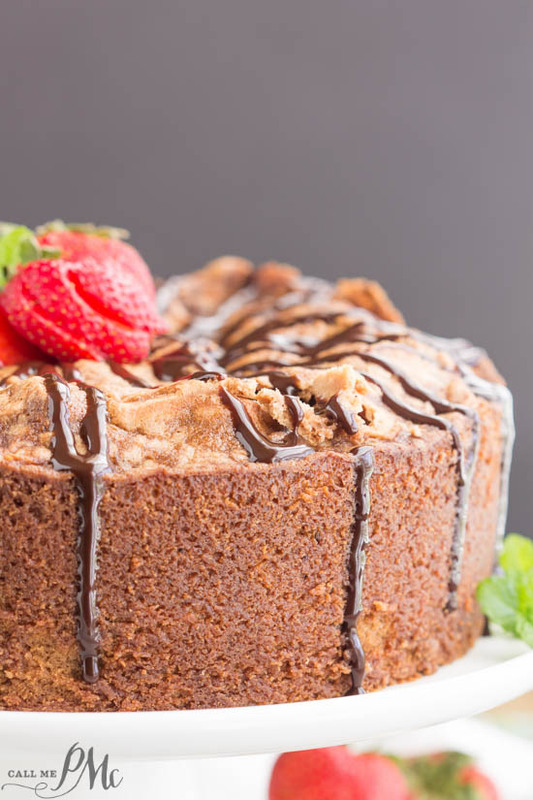 This Chocolate Pound Cake is hard to compare to the other pound cake recipes that I’ve shared. They have all had a butter vanilla flavor. This is like comparing apples and oranges. This is a very good cake and I make it a lot. It’s good with strawberries or raspberries and whipped cream. 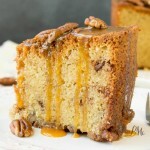 I still like the traditional vanilla pound cake, but this is fantastic for a change. 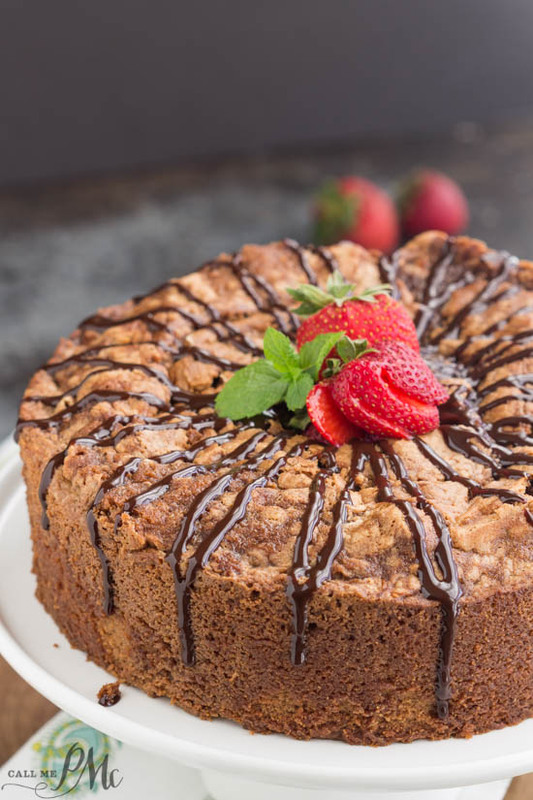 I do recommend giving Chocolate Pound Cake a try! 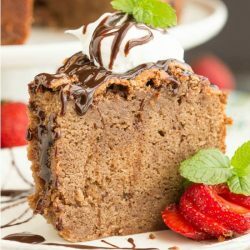 Dense and moist, this Chocolate Pound Cake recipe has a tender, small crumb and a lightly delicate chocolate flavor. Spray a 10-inch bundt or tube pan with non-stick spray. Cream butter, shortening and sugar together until creamy and fluffy. Add eggs, one at a time until incorporated. Sift together flour, salt, baking powder and cocoa. Mix coffee and milk together. With mixture on low, add flour mixture alternately with milk, mixing well after each addition. Bake at 1 hour 25 minutes. Cool on a wire rack 30 minutes before inverting on a serving tray. Seal in an airtight container after cake is completely cooled. Storeon countertop for 3 days or in the refrigerator up to 7 days. Visit Paula | CallMePMc.com’s profile on Pinterest. Hello, I would like to try your chocolate pound cake recipe but the amount of eggs was omitted from the ingredients so I don’t know how many eggs to use. Could you please help me out, thank you. Hi! I was wondering if substituting almond flour or coconut flour would be okay. I would need to probably add xanthum gum,(due to the flour not being all purpose). Any help would be appreciated. New to cooking for people with gluten allergies. I’m sorry. 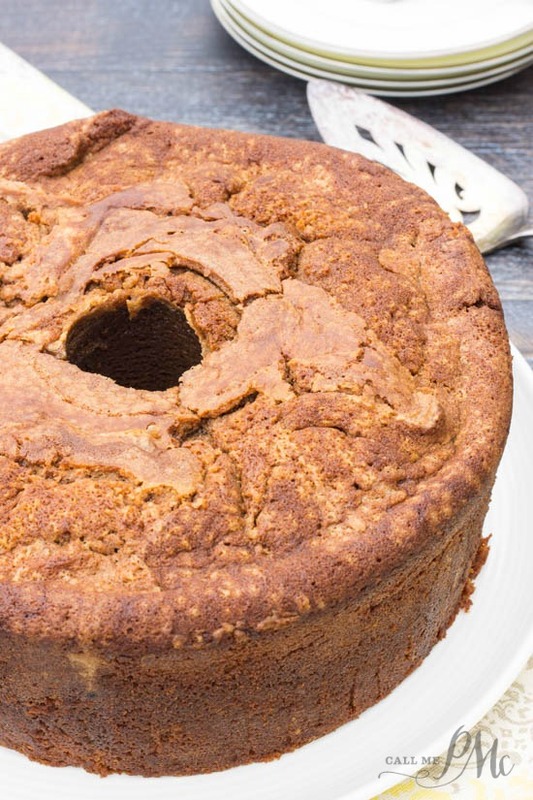 I’m no help using almond or coconut flour. I experimented a few times with small items like muffins without much luck.